On Saturday, August 25, Val and Laura Matthews will host the annual picnic and tool auction from 1-4PM. See the August newsletter for directions. 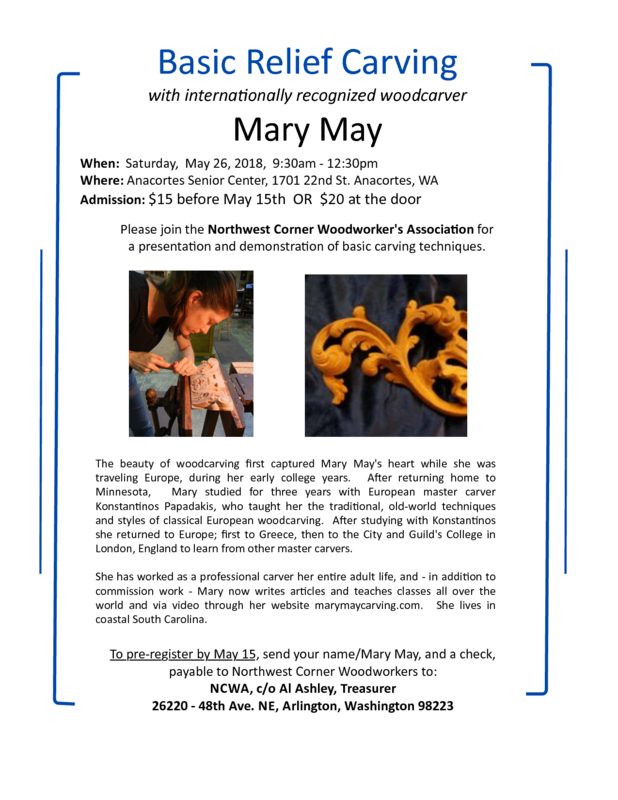 Our traditional combined Northwest Corner Woodworkers Association (NCWA) and Northwest Washington Woodturners (NWWWT) event takes the place of our normal monthly meeting. There is lots of room for parking. Bring tools you want to auction, and bid on something you find that you can’t live without. All you have to do is show up with a side dish (salad, desert or whatever), something cool to drink, and a lawn chair or two. Burgers, hotdogs, brats, fixings, soft drinks, water, paper plates, plastic ware and napkins are provided. Details on the auction process and entry form are in the newsletter. Expect to eat around 2PM. This year the Woodworkers are cooking! The speaker at our July meeting will be Jameson Hawn the owner/artist behind Riverbend Woodworks in Bellingham. Jameson will be presenting a how-to-video and open discussion about his process for carving realistic fish species and integrating them into fine furniture. He is a self-taught wood carver whose craft has evolved from simple beach-found wood carving to creating highly detailed trophy fish replicas for people around the country. His system for carving works whether you’re carving a trout or a tiger shark, so bring plenty of questions and be ready to plan your next fishing trip for some “field study”! How long does it take to become a woodworker? How many times do you have to make the same mistakes before you finally get it! In 1986, Jerry Couchman began his woodworking career after several items of furniture were destroyed during a USAF move from the Philippines to Hawaii. That accident inspired him to start making his own furniture, which eventually led to a woodworking business. 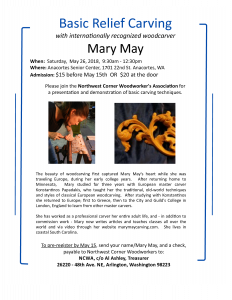 On June 5th, he’ll discuss important lessons he’s learned over the past 32 years that has made his woodworking safer, more accurate and more enjoyable. His presentation will include a slide show and live demonstrations. One of his favorite sayings is “The more mistakes you make, the more you learn!” If you’ve ever taken his box making class, you may have witnessed him making some of those mistakes in action! As an added bonus at this meeting, you could win a custom jig made in his shop that will be included in the June raffle!